Sometimes giants feel small. The people around them put them down all day for their tall stature. And sometimes good men become thieves. Like Robin Hood. Sometimes knights in shining armor don't know if they can complete their journey to save the princess. And sometimes lions feel cowardly. But as a smart man once said, "courage is not the absence of fear but rather the judgement that something is more important than fear." This is why it is okay for the lion to be cowardly. It is okay for the child in a costume to be afraid. Because when it really matters even the cowardly lion is courageous enough to stand up for what he believes in. 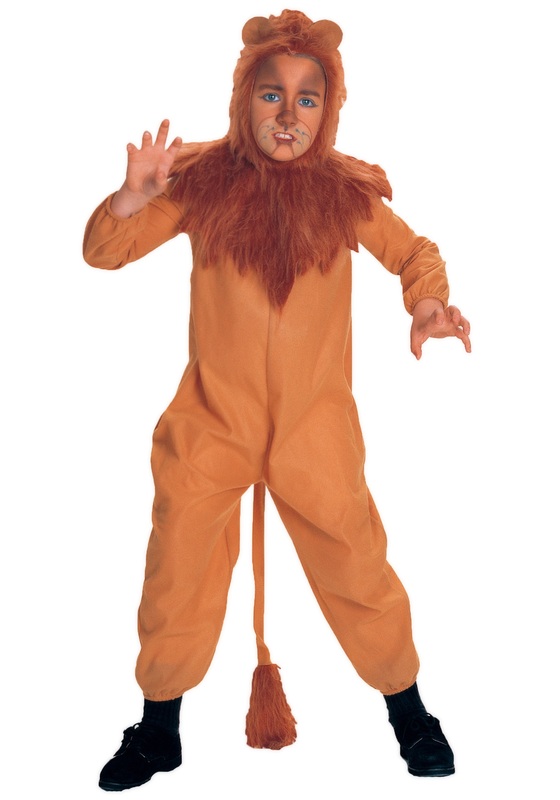 Your son maybe a little timid, but put him in this Child's Cowardly Lion Costume, and watch as he gains the courage to stand up for what he believes in, espescially if what he believes in is sticking with his friends through all the twists and turns in the road. Your otherwise quiet kid will feel the power of the lion course through him, and start running around roaring. Because yeah, sometimes giants feel small, good men become thieves, and knights don't know if they can go on. But those feelings are only momentary, like your son's shy, timid nature. They move past that moment in their lives, and so will he. Soon he will be the most popular kid in school. All it takes is a nudge with this "Cowardly" Lion costume.